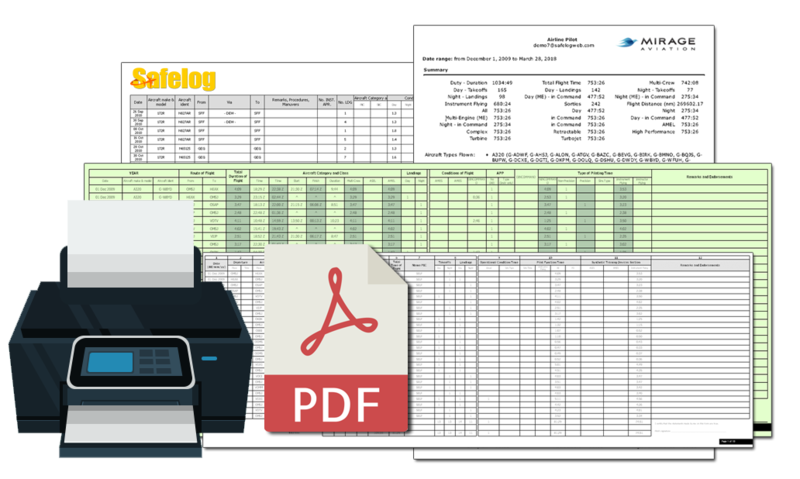 Safelog (both Safelog for PC and SafelogWeb) features incredibly powerful printing options - more powerful, more varied, and of higher quality than any other product out there, period. The video above is designed to show you some of the printing features in Safelog. However, it's just a small taste of the power and versatility of Safelog's output capabilities. Your logbook printed with the fields you want in the paper size you want to the margins you set. The above (and more!) can be exported to PDF, MS-Word, MS-Excel, CSV, XML, and many other popular output styles. Career summary reports, in PDF and HTML format. Charts and Graphs of your logbook data. Extreme flexibility as to the type of charts and the data shown on them. Currency reports, indicating where you stand with regards to pre-built and custom-definable regulatory and insurance/club/employer requirements. FAA Checkride Readiness analysis to help you and your instructor see where you stand with regard to FAA aeronautical experience requirements. Want to see some printouts? Click on "try a demo" or an equivalent link. Click on one of the demo logbooks that interests you. Click on the "printing and reports" tab at the top. Try navigating the tree at left and seeing the many reports available. For many of the reports, you can click on "save" to export this to a number of useful formats. Thanks again for checking out Safelog!